The European mathematician Alexander Grothendieck (in French sometimes Alexandre Grothendieck), created a very influential body of work foundational for (algebraic) geometry but also for modern mathematics more generally. He is widely regarded as a singularly important figure of 20th century mathematics and his ideas continue to be highly influential in the 21st century. Initially working on topological vector spaces and analysis, Grothendieck then made revolutionary advances in algebraic geometry by developing sheaf and topos theory and abelian sheaf cohomology and formulating algebraic geometry in these terms (locally ringed spaces, schemes). Later topos theory further developed independently and today serves as the foundation also for other kinds of geometry. Notably its homotopy theoretic refinement to higher topos theory serves as the foundation for modern derived algebraic geometry. Esquisse d'un programme, (January 1984), in which Grothendieck sketches out a vaste programme of research, encorporating many of the ideas from Long March. A copy is available here. It is discussed in brief at Grothendieck's Esquisse. À la poursuite des Champs (also entitled ‘’Pursuing Stacks‘’). It starts with a short (12 page) letter to Quillen, dated 19 Feb. 1983, but then discusses a wide ranging vision of homotopy theory and its applicability to problems in algebraic and arithmetic geometry. 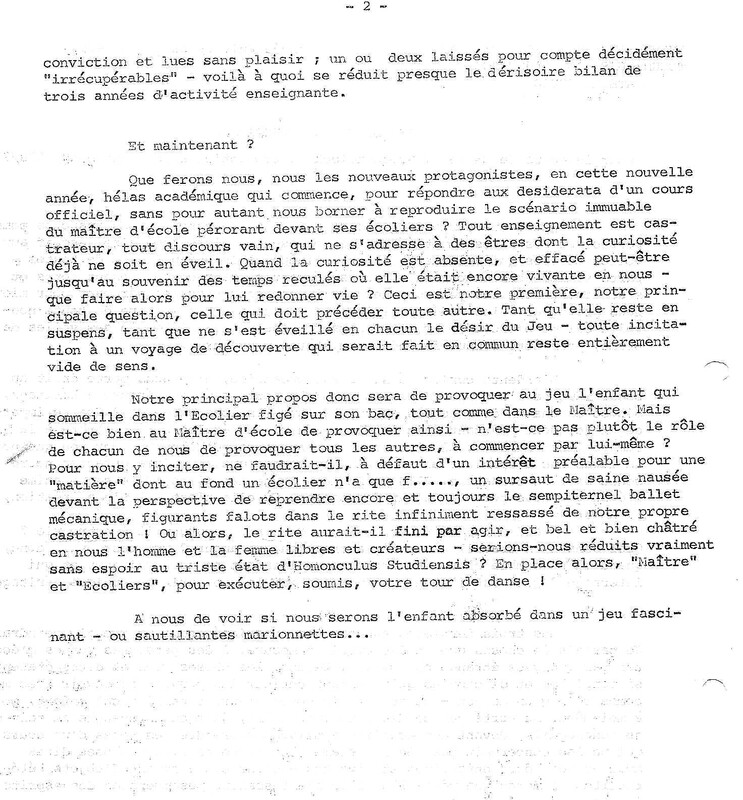 Les Dérivateurs (another 2000 page manuscript taking up some of the themes in Pursuing Stacks, section 69) Dating from the end of 1990 and the start of 1991. In the same time he also wrote voluminous intellectual memoirs Recoltes et Semailles. 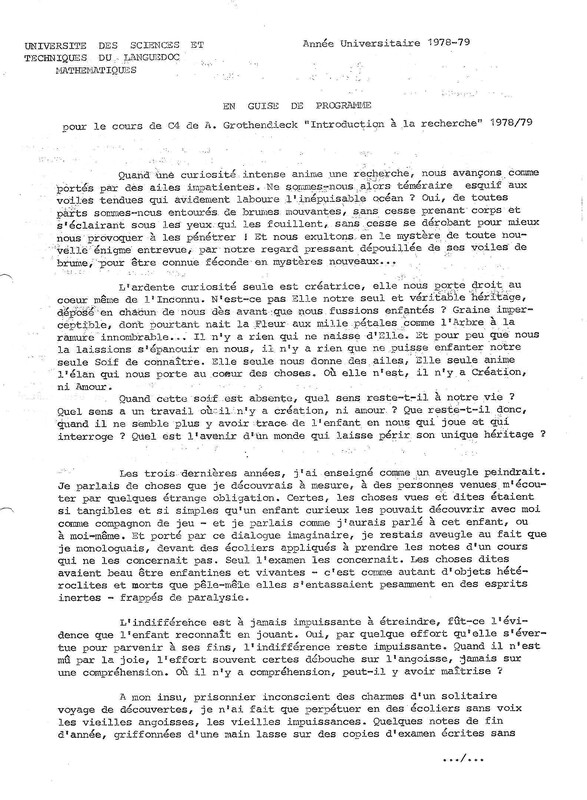 En Guise de Programme p I p II, a text written by Grothendieck as a course description while teaching in Montpellier “Introduction à la recherche”. A chronological bibliography of Grothendieck’s published mathematical writings (pdf). For an account of his work, including some of the work published in the 1980s, see the English Wikipedia entry. The video of a talk by W. Scharlau on his life can be seen here. Une entrevue avec Jean Giraud, à propos d’Alexandre Grothendieck (pdf). A recent article in French on Grothendieck is to be found here. “set of reminiscences by some of the many mathematicians who knew Grothendieck and were influenced by him.” Alexandre Grothendieck 1928–2014, (Part 2). Last revised on March 10, 2019 at 05:23:47. See the history of this page for a list of all contributions to it.